Wham is a mobile manufacturing company started in the year 2013 . It understands the rapid growth of consumer needs and strives hard to bring out the innovative products to customers. The company already launched 32 handsets in the Indian market priced from Rs. 1600 to Rs. 14,999. It also established new entities, to expand its services all over India with a 6 months replacement warranty. It expanded its services to 28 states with customer satisfaction at all the places. W1, WS47, WS53, W26i, w20, etc are different models designed and produced by the company. 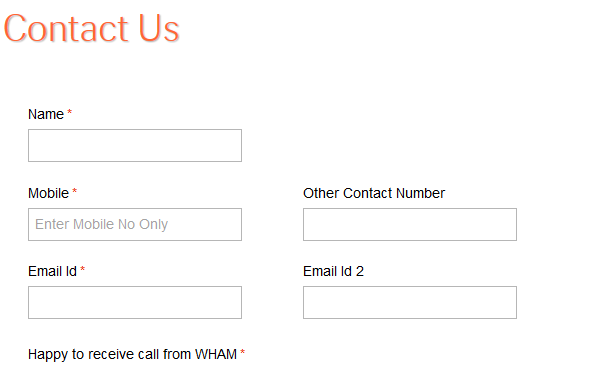 For any queries and assistance, customers can write their queries through Wham Contact From and the snapshot of the form is shown below for the reference. For more detailed information about the company products and services, kindly visit the company official Website .